Here’s the abstract, Biotechnol Lett. 2014 Mar;36(3):461-9. doi: 10.1007/s10529-013-1382-4. Epub 2013 Oct 16. Lectin of Abelmoschus esculentus (okra) promotes selective antitumor effects in human breast cancer cells. The anti-tumor effects of a newly-discovered lectin, isolated from okra, Abelmoschus esculentus (AEL), were investigated in human breast cancer (MCF7) and skin fibroblast (CCD-1059 sk) cells. AEL induced significant cell growth inhibition (63 %) in MCF7 cells. The expression of pro-apoptotic caspase-3, caspase-9, and p21 genes was increased in MCF7 cells treated with AEL, compared to those treated with controls. In addition, AEL treatment increased the Bax/Bcl-2 ratio in MCF7 cells. Flow cytometry also indicated that cell death (72 %) predominantly occurred through apoptosis. Thus, AEL in its native form promotes selective antitumor effects in human breast cancer cells and may represent a potential therapeutic to combat human breast cancer. Don’t get your hopes up about that 72% figure: that seems to be that when cancer cell death occurred, 72% of it was related, not that 72% of cancer cells were killed. The 63% cancer cell growth inhibition does seem promising, though. 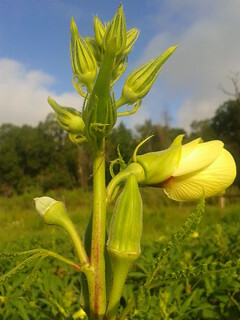 This entry was posted in Health, Okra, Okra Paradise Farms, Plants and tagged breast cancer, cancer, Georgia, Gretchen Quarterman, Health, John S. Quarterman, Okra, Okra Paradise Farms, Plants, prostate cancer on July 17, 2014 by John S. Quarterman. the appeal, too. Now the court is gauging losses to determine penalties for Monsanto. This after back in 2009 France convicted Monsanto of lying about its claims that Roundup was “biodegradable” and “left the soil clean”. And Argentinean tobacco farmers are suing Monsanto in New Castle County Court, Delaware, saying Monsanto “knowingly poisoned them with herbicides and pesticides and subsequently caused ”devastating birth defects” in their children”. These same Monsanto herbicides and pesticides are sprayed on most fields around here, and they’re just as much poisons here as in Argentina or France. This entry was posted in Agriculture, Agrochemicals, Glyphosate, Health, Law and tagged Agrochemicals, alachlor, birth defects, cancer, France, Georgia, Glyphosate, Health, intensive agriculture, John S. Quarterman, Law, Lowndes County, Monsanto, nerve damage, Okra Paradise Farms, organic agriculture, Paul FranÃ§ois, poison, Roundup on May 25, 2013 by John S. Quarterman. Previous studies, including ones by Dr. Séralini, already showed exposure to glysophate (the active ingredient in Roundup) to be “a risk factor for developing Non-Hodgkin lymphoma”, and to be toxic to human umbilical, placental, and placental cells with a that “is far below agricultural recommendations and corresponds to low levels of residues in food or feed.” In Argentina, Prof. Andrés Carrasco has demonstrated birth defects in amphibians and there is increasing evidence of human birth defects. Regarding Monsanto’s GM corn itself, we already knew it causes liver and kidney damage in rats (later reverified using Monsanto’s own data), and chickens fed feed including Monsanto corn show abnormal gene expression. Now we have even more hard evidence of the toxicity of Monsanto’s GM corn and of Monsanto’s Roundup. The journal article is available through Wiley online. This entry was posted in Agriculture, Agrochemicals, Food, Food and Drink, Glyphosate, Health, Safety, Science and tagged birth defect, bT, cancer, corn, feed, Food, gene expression, genetically modified, Gilles-Eric Séralini, Glysophate, GM, hazard, Health, human, kidney, liver, maize, Monsanto, Non-Hodgkin lymphoma, poison, residue, risk, risk factor, Roundup, toxic, toxin on February 21, 2012 by John S. Quarterman. Aug 2 (Reuters) – Pancreatic tumor cells use fructose to divide and proliferate, U.S. researchers said on Monday in a study that challenges the common wisdom that all sugars are the same. “These findings show that cancer cells can readily metabolize fructose to increase proliferation,” Dr. Anthony Heaney of UCLA’s Jonsson Cancer Center and colleagues wrote. This entry was posted in Agrochemicals, Food and Drink, Health, HFCS, Safety, Science and tagged Anthony P. Heaney, cancer, Cancer Research, coronary artery disease, diabetes, HFCS, high bloood pressure, high fructose corn syrup, Maggie Fox, obesity, pancreatic cancer, Reuters, transketolase flux, tumor, UCLA on August 4, 2010 by John S. Quarterman. So, having just spent a decade breeding mutant superweeds by pouuring pesticides on crops, what’s the recommended future of weed science? This entry was posted in Agriculture, Agrochemicals, Economy, Health, Paraquat and tagged 2, 4, 4-D, 5-T", Agent Orange, birth defects, bleeding, cancer, carcinogen, damage, diooxin, DNA, eye, farmer, future, hazardous, intoxication, irritation, Mutagenic, mutant, Palmer amaranth, pigweed, skin, superweed, Teratogenic, toxic, Vietnam, Water, weed science on August 1, 2010 by John S. Quarterman. For now, without a law regulating the use of GMOs in Haiti, the Ministry of Agriculture rejected Monsanto’s offer of Roundup Ready GMOs seeds. In an email exchange, a Monsanto representative assured the Ministry of Agriculture that the seeds being donated are not GMOs. Haitian social movements’ concern is not just about the dangers of the chemicals and the possibility of future GMOs imports. They claim that the future of Haiti depends on local production with local food for local consumption, in what is called food sovereignty. Monsanto’s arrival in Haiti, they say, is a further threat to this. Maybe people in other countries will also act to preserve what is left of our environment. This entry was posted in Agriculture, Agrochemicals, Development, Economy, Food and Drink, Health, History and tagged birth defects, cancer, Chavannes Jean-Baptiste, earthquake, food sovereignty, GMO, Haiti, Health, local food, Monsanto, MPP, Roundup on May 20, 2010 by John S. Quarterman. OMAHA, Neb., May 17 /PRNewswire-FirstCall/ — Hunt’s®, a ConAgra Foods brand, is pleased to announce that it has removed the high fructose corn syrup from every bottle of its ketchup products. Hunt’s 100% Natural Ketchup brings forth the naturally rich tomato flavor of Hunt’s tomatoes and contains only five simple ingredients: tomatoes, sugar, vinegar, salt and other seasonings, with no high fructose corn syrup, artificial ingredients or preservatives. So a corporation that doesn’t care about science that says a key ingredient in their product makes rats fat, every one of them, in ways that produce the same risk factors that in humans contribute to high blood pressure, coronary artery disease, cancer, and diabetes, that same corporation does care when its customers say they don’t want that ingredient. (1) The 2009 HealthFocus® Trend Report indicated consumer concern over high fructose corn syrup has risen from 27% of shoppers being extremely or very concerned in 2004 to 45% of shoppers in 2008. Voting at the supermarket checkout works. This entry was posted in Agrochemicals, Economy, Food and Drink, Health, HFCS, Science and tagged cancer, ConAgra, coronary artery disease, diabetes, fat, HealthFocus, HFCS, high blood pressure, high fructose corn syrup, Hunt's, ketchup, Melanie Warner, rats, Ryan Toreson, Science, shoppers on May 18, 2010 by John S. Quarterman. An expert panel that advises the president on cancer said Thursday that Americans are facing “grievous harm” from chemicals in the air, food and water that have largely gone unregulated and ignored. The President’s Cancer Panel called for a new national strategy that focuses on such threats in the environment and workplaces. Epidemiologists have long maintained that tobacco use, diet and other factors are responsible for most cancers, and that chemicals and pollutants cause only a small portion — perhaps 5 percent. The presidential panel said that figure has been “grossly underestimated” but it did not provide a new estimate. “With the growing body of evidence linking environmental exposures to cancer, the public is becoming increasingly aware of the unacceptable burden of cancer resulting from environmental and occupational exposures that could have been prevented through appropriate national action,” the panel wrote in a report released Thursday. This entry was posted in Agriculture, Agrochemicals, Food and Drink, Glyphosate, Health and tagged agrochemical, air, asbestos, cancer, carcinogen, chemical, DDT, diet, dioxin, endocrine, Food, Glysophate, herbicide, PCB, pesticide, pollutant, President's Cancer Panel, Roundup, supermarket, tobacco, Water on May 7, 2010 by John S. Quarterman.